Posted by Ali Kane on Friday, August 25th, 2017 at 12:04pm. Along the sandy shores in Juno Beach every year between March and October, thousands of sea turtles lie eggs in the sand. The sea turtles nest roughly contains about 100 eggs that require roughly between 45 to 60 days before they start hatching. Making this area one of the most populated sea turtle nesting locations in the world. The reason why so densely populated is due to the gulf stream current bending toward Florida, as well as the close proximity to the Sargasso Sea, a region in the North Atlantic Ocean. 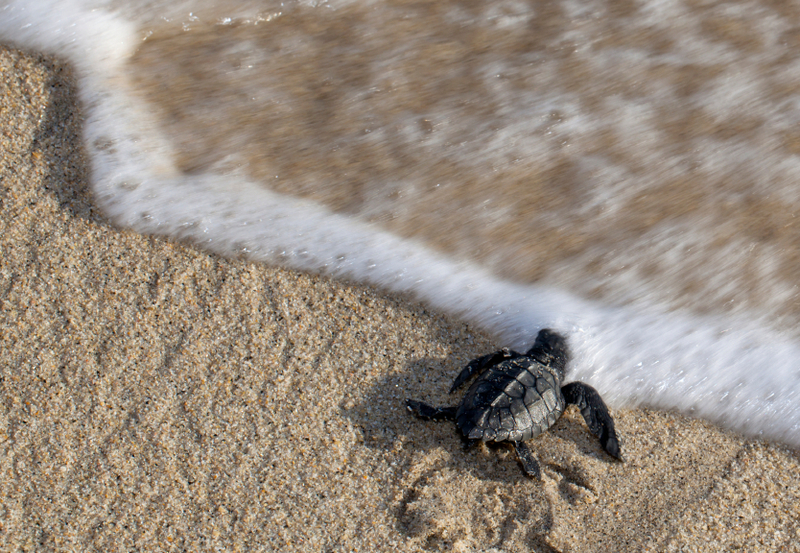 The sea turtles journey is not easy, roughly a range estimating from 1 in 1,000 to 1 in 10,000 sea turtles survive to make it into full adulthood. The turtles face a large number of predators along the way, including fire ants, fish and even humans. Even though sea turtles bury their nest in the sand it’s always important to watch where you are walking next time you are on the beach. There are three species of sea turtles: Green, Loggerheads and Leatherbacks. Those three species of turtles all use Juno Beach as a nesting place for their eggs, and all have been protected under the Endangered Species Act. Luckily, the Loggerhead Marinelife Center in Juno Beach focuses on helping and rehabilitating endangered and injured sea turtles through their research and educational programs. Loggerhead Marinelife Center monitors the nearly 10-mile stretch where sea turtles nest, and provide an onsite hospital to care for the sick and injured turtles before giving them a change to be released back into the ocean. Last year, Loggerhead Marinelife Center saved over 16,000 sea turtles nests, making them a competitor for the most densely populated sea turtle nest locations. At the end of the year, the center plans to expand their current location to provide more space and research for sea turtles.